Learn how to turn a brown pear and carrot in to a creative kids' snack they'll love! 1. Grab your brown pear and using your knife, slice the brown skin off the bottom half of the pear. Also make a slice off the back of the pear so that the pear will lie flat on the plate. Place your large piece of pear on a plate. 2. Take the remaining slice you cut off the back of the pear and slice it in half. Place the halves on either side of the penguin’s body for it’s wings. 3. Using your knife, slice your baby carrot into a triangle shape for a nose and 2 circles for the feet. Place these on your penguin. 4. Finally, stick 2 icing eyes on the penguin’s face. So easy and so cute! 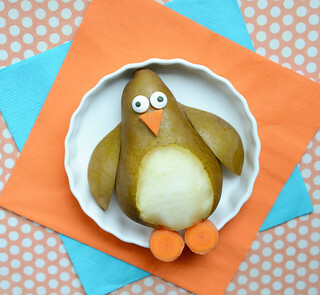 This adorable little penguin snack is sure to please even the pickiest of eaters. Enjoy!